Plate Size in relation to portion control seems so simple a concept, but one which has mostly gone unnoticed at the dinner or restaurant table. I have written before regarding how helpful it is to look at not only the utensils but also the size of the plates we use when dishing out food. It just so happens that a few days ago on Food Network’s Food Detectives the Plate Size/Portion Control connection was confirmed with a scientific experiment conducted in collaboration with Dr. Brian Wansink. The experiment was performed on two groups who were each served the exact buffet-style meal, one group using a small plate and the other using a significantly bigger plate. It was found that the group with the larger plates ate about 38% more food than the group using the smaller plates, and that was even with the smaller plate group having seconds. The findings show that plate size does truly matter when it comes to eating, because we usually tend to eat what we put on our plate. So instead of measuring food, as a diet would have you do, begin with changing your plates instead. That way food portion management becomes something you can begin to do with very little thought. Take in consideration the Total Diameter of the plate including the rim or border. Things get so much easier when we don't have to think about them all the time, and then they actually work. Switching to a smaller plate size and only eating what can reasonably be added to the plate is a simple thing to do. 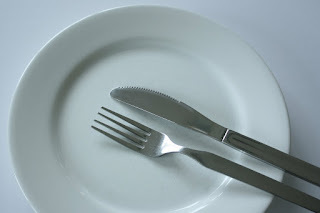 As a true Non-Dieter you must pledge to no longer be a slave to food; and finding ways to make weight management and mealtime effortless is key. Changing your plates is an easy start. Thanks! I am really glad that you liked the article and found value in it.